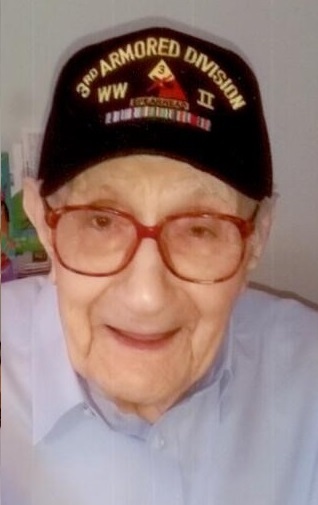 John George, age 101, died Thursday, August 16, 2018 at his home in Jefferson Hills, Pennsylvania with family members by his side. He was born John James George on March 8, 1917 in Clairton, Pennsylvania one of four children of James and Nora (Meena) George. John was a WW II, U. S. Army Veteran, who served with General Bradley in the European Theater, the 3rd Armored Division. He was awarded several Medals and 2 Bronze Stars for his military service. He was a US Steel employee, working over 30 years in plants in the Monongahela Valley of Pennsylvania, retiring as a Crane Operator. In addition to his parents, he was preceded in death by his wife Viola (DeFalco) George on December 30, 2013; a son-in-law, Bob Sheets and all of his siblings, Kelly, Fannie and Charles George. John is survived by his two children, son, James (Michele) George of East Brady, Pennsylvania and daughter, Holly George of Arlington, Virginia; four grandchildren, Dr. Peter (Jodi) George, Cammi (Pat) Mulligan, Michael (Sandy) George and Michele T. George; nine great grandchildren, Jessica, Kylie and Alexis George, Daniel, Kathleen and John Thomas Mulligan and Connor, Ryan and Tyler George; he is also survived by many nieces and nephews. Friends will be received in the Stephen D. Slater Funeral Home 1701 Route 51 (Large) Jefferson Hills (412-384-0350) on Monday, August 20, 2018 from 4 – 8 PM. There will be a prayer in the funeral home on Tuesday, August 21, 2018 at 9:15 AM followed by a Mass of Christian Burial in St. Clare of Assisi Parish in Clairton, Pennsylvania at 10 AM. John will be entombed, next to his wife, in the Mausoleum of St. Joseph Cemetery in North Versailles, Pennsylvania with Military Honors.